Doing these tasks one file at a time is boring and time consuming. However, using batch processing software that allows multiple steps to be applied to many files at once is fast and easy. Adobe Photoshop allows a person to do custom batch processing by using the Action and Batch commands to program exactly what is needed. Turnkey software (pre-built software for immediate use) performs certain tasks such as resizing images and reformatting files. To learn how to resize images in Photoshop, watch the following videos. • "How to Batch Resize Photos in Photoshop - Photoshop Samurai"
• "[Tutorial] Batch Resize Images in Photoshop CS5"
• "Photoshop Tutorial - Custom Batch Resize Action"
Note: The videos show resizing the images in pixels and not in inches. Pixels express the resolution and size of the image. 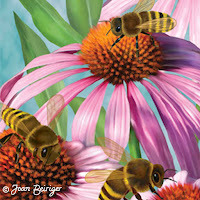 In art licensing, low resolution (LoRes) files are usually 72 dots per inch (dpi) and high resolution (HiRes) 300dpi. 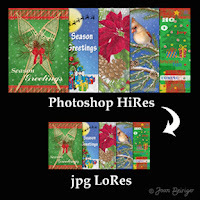 So if an image is going to be converted to a 5 by 7 inch image, then the width equals 360 pixels at LoRes (5 times 72) and equals 1500 pixels at HiRes (5 times 300). To learn how to apply a logo, a signature or watermark in Adobe Bridge /Photoshop watch "Adobe Bridge/Photoshop - Batch Processing Part 1 | How to Brand Your Images" and to find out more on using Photoshop batch processing for numerous tasks read "Photoshop Tips: Improve Workflow with Photoshop Actions Command." There are many software packages that are programmed to resize images and do other tasks. Some charge a reasonable fee and others are freeware (free but ask for a donation). Read "Batch Processing: 25 Tools and Techniques for Images and Documents" for a description and links to many of them. Note: I normally do not endorse software but I have found EasyBatchPhoto ($19.99) invaluable in resizing images for specific formats. Yes, I could program Photoshop to do the same type of batch processing but EasyBatchPhoto is faster and easy to assign the tasks. After assigning the tasks all you need to do is drop Photoshop files into the EasyBatchPhoto window and in seconds to minutes later (depending on the initial size of the files) the converted files appear in the destination folder.